Meguiar's All Season Dressing will rejuvenate your rubber and plastic pieces leaving behind a deep, rich and long lasting shine! This dressing requires no diluting and the deep rich color it leaves behind on your plastic and rubber will turn heads. You can spray this product directly on to your rubber and plastic, however we recommend misting it onto a clean microfiber towel, or applicator pad and wiping the areas down to avoid over spray. If you get any on the paint or surrounding areas simply remove it with a clean cloth right away and you're all set. 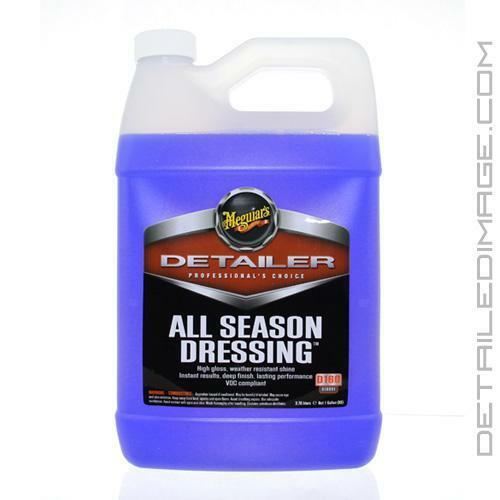 If you are looking for a long-lasting dressing that provides the deep gloss on your exterior rubber and plastic pieces, then look no further then the Meguiar's All Season Dressing! Pair with the Meguiar's All Season Dressing Bottle and the DI Accessories Chemical Resistant Spray Trigger for easy dilution, storage, and usage! Meguiar's All Season Dressing *Meets CARB's VOC limit for Rubber/Vinyl Protectant formula that produces a deep, rich, long lasting shine on all exterior rubber and plastic surfaces. Old or new, weathered or worn, All Season Dressing will give you the desired results time after time. DIRECTIONS: For best results, always apply to a clean, dry surface. Spray evenly over surface, allow product to dry. PROFESSIONAL TIPS: After spray application, lightly dampen a towel or sponge with All Season Dressing and wipe over the surface, especially in grooved areas. NOTE: Possible staining on painted and non-painted plastic panels. Should splatter occur, remove immediately. Do not use on tires or seats of motorcycles, bicycles or other two-wheeled vehicles or surfaces that should not become slippery.